Sometimes you’re just in the mood for a bowl of Satyricon peppered with an overwhelming dose of Falkenbach folk metal. Maybe you’d like it sprinkled with a dash of Emperor’s classical elements and a bit of that Summoning fortitude too. Or maybe not. Either way, in the case of Austria’s Rauhnåcht, perhaps this dish is worth a try. 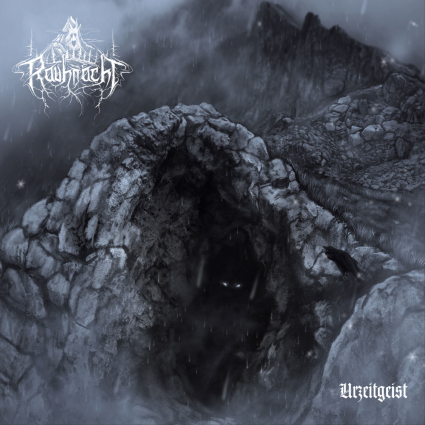 On Urzeitgeist, Austrian musician Stefan Traunmüller (Wallachia, Golden Dawn) presents you with a tasty morsel containing only the best ingredients of the less raw ’90s black and pagan metal sounds. While little new ground is being broken on this, Rauhnåcht’s second full-length, the tokens of that dark metal era dear to our hearts are herein written and performed from a such place of discernment and respect that I was pulled back to it after a couple hours of promo-playing purgatory. Urzeitgeist bounces forward and back with boisterous programmed beats, catchy vocal rhythyms (Satyr would be proud) and nicely layered orchestration (orchestration without big-budget pretense, mind you). Couple this with pagan instrument-performances steering clear of redneck Ren-Fest buffoonery, and you are left with melancholic passages that deftly carry your soul back to the Medieval times of the music’s harkening. But as this album moves on, Traunmüller proves he knows how to mesmerize as well as transport. On ‘Zeitentor’, a Burzum/Bathory homage of high quality drones you into glassy-eyed submission, but not before closing your gaping mouth with a Summoning-style march into Mordor that will surely have you standing up with mop-handle in hand, ready for battle. As this Varg/Quorthon/Protector trifecta also remains in full effect on the album’s closer ‘Ewigkeit’, these final songs comprise Urzeitgeist’s most standout compositions – and with their cold, rigid evocation, this music (as their label suggests) can rightfully be described as ‘Alpine Black Metal’. ~ by cliftonium on February 19, 2014. This entry was posted on February 19, 2014 at 7:31 pm and is filed under ALL REVIEWS, R-reviews.You can follow any responses to this entry through the RSS 2.0 feed.You can leave a response, or trackback from your own site.